Shinsuke Ishihara (Tokyo, Japan, 1975). Shinsuke Ishihara began his musical studies at the age of three receiving tuition on piano. In 2000,Shinsuke Ishiahra was a grand winner of Tenuto Music Competition(Belgium),and he was also awarded the Sabam Prize for the best interpretation of a set piece. 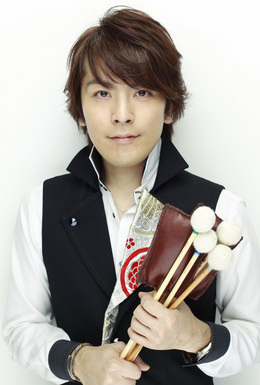 In 2001,He won 3rd prize at Tromp Music Competition. In 2002,Shinsuke Ishihara received 2nd Prize at the 3rd World Marimba Competition Stuttgart. Shinsuke Ishihara,released first Debut Solo CD”Infinity” as artist name “SINSKE” on 2003,2nd album”Self Exposure” on 2004,3rd album “That’s Marimba” on 2006,4th Album “Door of Memories” on 2008,5th album”Sound Track from Dance Garaxy” on 2010,all from Sony Music Japan Entertainment. SINSKE plays many concerts over the world with great artists like Keiko Abe(Japanese Marimbist),Ludwig Albert(Belgian Marimbist),Emiko Utiyama(Japanese Marimbist),Bart Van Aken(Djambe),Keiko Matsuzaka(Actress),Naoki Ishikawa(Drumcor from Brast! ),Adam Rapa(Trumpet player from Brast! ),Brandon Everson(Trombone player from Brast! ),Douzan Fujiwara(Shakuhati) ,Ivan Smellders(Accordion),Jake Shimabukuro(Ukulele). And he works with great orchestras,Brass Band,Dance company,contemporary music ensemble like as below,Rosas Dance Group,Vlaams Radio Symphonic Orchestra,Ictus Ensemble,Ensemble Collective,Prometheus Ensemble,Denhaag Percussion Group. In this moment he is focusing more to make a new projects and style with marimba without any border of Music.He performed more for the General Audiences ,Radio,TV show,,,and so on. His busy touring schedule has taken him to Germany,Holland,France,America,Africa and all major Japanese cities where his solo recitals and projects,concerts have been met with high critical acclaim.